Beckham's One-Handed TD Catch Really the Greatest? 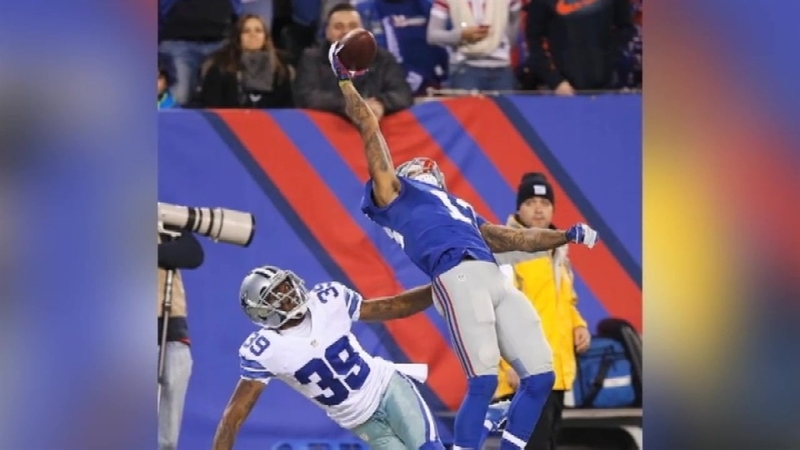 When Odell Beckham Jr. made this one-handed catch in 2014, some said it was the best they'd ever seen. A Long Island sports physicist says there's a reason why the catch was even more extraordinary than people think. John Chandler reports. The football was hurtling past Odell Beckham Jr. when the Giants rookie squeezed it with his right hand, stopping its momentum before cupping it safely over his blue jersey. He did this while stretching parallel to the turf. In the air. And for good measure, he was interfered with by Cowboys cornerback Brandon Carr, who tumbled helplessly out of bounds as Beckham's momentum carried him over the goal line for a 43-yard touchdown and a 14-3 Giants lead. The play was reviewed because Beckham did things in midair that are simply not believable to the naked eye. The officials had to see it again. It was quite possibly the greatest catch ever seen on a football field, according Beckham’s Giants teammate Victor Cruz. And LeBron James. And well, for the rest of the Twitter world. "I guess I gotta thank my mom for the long fingers," said Beckham, after what can only be described as a breakout performance. If he was on the radar of NFL fans heading into Sunday, then a 146-yard two-touchdown night puts him on the league’s map of superstars. He just became an overnight sensation. But greatest is a pretty hefty label. Watching on Long Island, physics professor Chang Kee Jung didn’t think of it that way until Monday morning, when he started analyzing the catch in his office at Stony Brook University, where he teaches a sports physics class. “It’s just ridiculous,” said Jung, noting that a football spirals through the air rotating at a speed somewhere between 400 and 500 rpm. It’s that fact which Jung believes separates this catch from others, like David Tyree in the Super Bowl. Where most one-handed grabs are made by cupping the nose of the football, in this case, as Beckham reached back for the ball with his right hand, he could only get three fingers on the ball. Improbably, that was enough to stop the momentum of a ball travelling as fast as 50 mph. “Everything has to be just right,” said Jung. 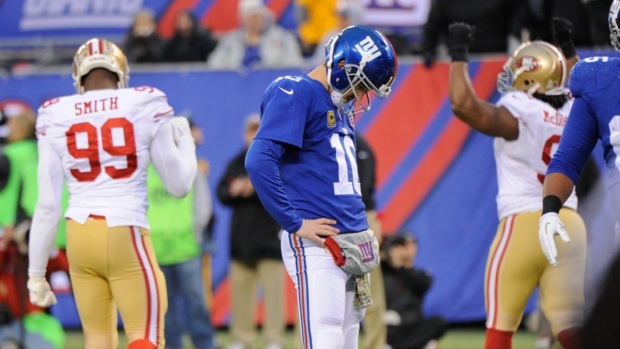 Beckham says Eli Manning’s throw was a perfect spiral in exactly the right spot. Of course, had he not been interfered with, it’s likely a catch in his chest and a routine 43-yard touchdown. “He practices that one-handed snag,” said Manning, who pointed out the one flaw in the whole “Greatest Catch” theory. The Giants didn’t win the game.